Seems like another new game in the making and started quite a while ago... but no one posted anything about it so here's a thread to keep things updated perhaps? This seems like the game's main website... -Click Here- Also, this place looks a bit familiar though? and the production team can be found at the bottom of the site's main page. A demo version looks to be released to public in November and the full version planned for next year's June. From the site's description, it seems there will be 2 Extra Stages... one is the Extra ( Difficulty range between Normal-Hard ) that we all know, and the other Hell Extra (Difficulty slightly below Lunatic ) that will be unlocked after clearing Extra Stage. This looks pretty neat. The mechanics look...well, not sure how exactly I feel about them. Every time I saw the column pop up, I kept thinking it was the "Wild Exorcism Dance" bomb. Stage 2 theme sounds cool. Looks like I'll just continue to wait warmly. Unpopular shot types are still usable! Hmmm... I've not seen anything about this until recently, so I'd have to keep an eye out. Pesot.jp and Wanwan doing stuff for it is also pretty nice, so I'm looking forward to the music at least. Reminds me, good god Book of Star Mythology and Brilliant Pagoda or Haze Castle aren't going to be out for awhile, huh? >Sɪɴᴄᴇ ʏᴏᴜ'ᴠᴇ ᴀᴡᴀᴋᴇɴᴇᴅ ʜᴇʀ ᴀɢᴀɪɴ. >Sʜᴇ ᴅᴇᴘᴇɴᴅs ᴏɴ ʏᴏᴜ. >Sʜᴇ ᴅᴇᴘᴇɴᴅs ᴏɴ ʏᴏᴜ. First WNSP makes Reimu and co. look funky and now she looks 12. Otherwise, interesting. I can't read Japanese so I can't get a sense of the mechanics, though. >Sʜᴇ'ʟʟ ɢᴏ ᴀʟᴏɴᴇ, ᴀɴᴅ ɴᴇᴠᴇʀ sᴘᴇᴀᴋ ᴏғ ᴛʜɪs ᴀɢᴀɪɴ. Wᴇ ᴅᴇᴘᴇɴᴅ ᴏɴ ʏᴏᴜ. Wᴇ ᴅᴇᴘᴇɴᴅ... I'ʟʟ ᴅᴇᴘᴇɴᴅ ᴏɴ ʏᴏᴜ. >I ᴅᴏɴ'ᴛ ᴋɴᴏᴡ ᴍᴜᴄʜ ᴀʙᴏᴜᴛ ʏᴏᴜʀ ʟɪғᴇ ʙᴇʏᴏɴᴅ ᴛʜᴇsᴇ ᴡᴀʟʟs. >Aɴᴅ ʏᴏᴜ ᴄᴀɴ ʜᴇᴀʀ ɪᴛ ɪɴ ʜɪs ᴠᴏɪᴄᴇ, ɪɴ ᴇᴠᴇʀʏ ᴄᴀʟʟ. 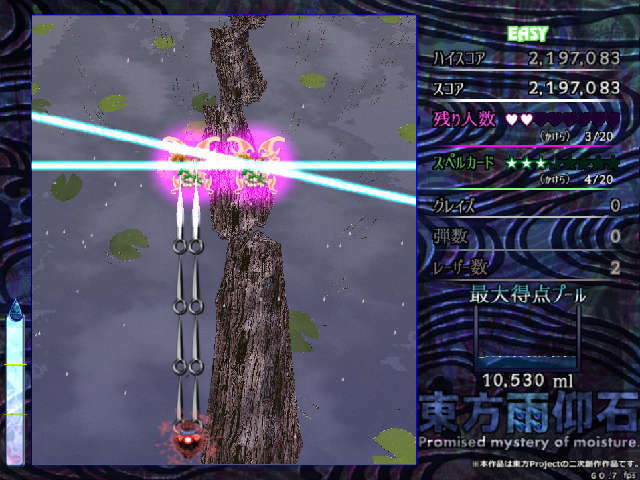 Reimu having the forward focus lasers makes me wonder what Sukuna and Marisa's shots are. The stage 1 danmaku was... more underwhelming than expected (the second part of the boss, uhh? ), but, it was stage 1 after all. The lunatic peek was pretty satisfying. This is Souten and co.'s most recent STG after Avant-Garde Discerning Paralleler. I really liked AGDP!! So I'm excited. Like AGDP, the game mechanics are heavily focused on chain-based scoring while still being accessible to casual players. The dev team is aiming for a demo release around November 2016 and a (free?!) full release around June 2017. Since this is Souten's first time working with DirectX 11, they also plan to put out a 1-stage test build in hopes of collecting bug reports. The story is that tons of stones in Gensokyo are being mysteriously converted to rainstones (probably inspired by the weather stones in WaHH 17). Since rainstones assist in praying for rain, there's been a nonstop downpour for several days now. Reimu's purification rod and Marisa's Mini-Hakkero are soaked through, so they're using somewhat different shot types than usual. Reimu Hakurei - In addition to her usual hitbox and speed, defeating enemies will extend the Rainfall Field timer by twice as much. Shot: "Persuasion Needle" / "Red-White Luminous Flux" - Your basic forward laser type, usually seen from Marisa. Bomb: Spirit Sign "Curse-Killing Food Offerings" - Full-screen amulet attack. / Divine Enclosure "Iron Protective Charm" - Circular barrier that can withstand several hits. Marisa Kirisame - In addition to her usual speed and ease of item collection, she has a wider Rainfall Field than the other characters. Shot: "Magic Homing Missile" / "Orreries Bit" - Locks on to enemies similarly to DDC Reimu-A? Bomb: Close Sign "Orreries Big Crunch" - Full-screen attack. / Magic Tool "Magic Extractor" - Turns bullets into rainstone items. Shinmyoumaru Sukuna - Can graze more easily and increase point item value more than the other characters. Hitbox becomes smaller when low on lives and bombs. Shot: "Shining Needle Sword" / "Oni-Killing, Eye-Stabbing Needles" - Homing needles and forward focus needles. Like Reimu's usual from TD onward? Bomb: Mallet "Giant Promotion Boulder" - BIG ROCK SMASH / Wise Song "Little Melody" - Shrinks all on-screen bullets. You get three uses out of a single bomb. Collecting rainstone items will fill the gauge on the left-hand side of the screen. Pressing C with the gauge at least 1/3 full will expend 1/3 of the gauge to create a vertical Rainfall Field centered on the player. Any items that appear within this field will be duplicated, including life and bomb fragments, and graze will be doubled (quadrupled for Shinmyoumaru). The field has an initial timer of 5 seconds, which is extended by 0.25 seconds (0.5 for Reimu) for each enemy you defeat while it's active. Point item value is represented by the water tank on the right-hand side of the screen. It starts off at 10,000ml and gradually drains (to 0, if you're not careful!). Collecting rainstone items with a full rain gauge, or an active Rainfall Field, will fill the tank. Bullet-clear items, graze, and Spell Card bonuses are all connected to the point value tank as well. Also, point items will turn yellow to indicate when they're at max value. edit: souten, not aoten!! im dumb!!!! We see Marisa's gameplay on hard mode. Looking on this video and the previous one, the girls don't shot a single bullet by themselves, rather, they use their familiars (those small balls). Looking at Marisa, my thoughts were, "she looks OP". Infinite (homing) range, very effective against random fairies; even if her focused shot seems to make half as much damage as Reimu's; her Magic Extractor bomb giving items like candy. Maybe her unfocused shot has a higher DPS, with so many missiles. Yes, it's similar to DDC ReimuA, through her focused shots doesn't seem to do area-of-effect damage, but it does lock on instantly and jump from enemy to enemy. I love how the mechanics sound so far. Can't wait for a demo release! Good to see a nice fangame STG again. Haven't been interested in any of those since I finished the Phantasm in RSS. I'll keep an eye on this one. I play Touhou on Twitch and YouTube. I'm not that good, but I'm informative when I can be. Follow me. Edit: Downloaded, said that msvcp120.dll was missing from my computer. Good thing i can do some basic internet browsing. Get your stuff here. Readme.txt has a notice for future updates. I'll edit again after actually playing the game. Edit the second: This earliest demo offers Reimu and Marisa as players (no Shinmyoumaru). Only 1 stage, all four difficulties. I seem to have performace problems when using Marisa's bomb (Reimu's bomb is fine), and on Kogasa's first boss card on lunatic (not the midboss card, i mean the one with rainbow bullets all aimed which it's basic streaming). Played it and it seems nice. The first spellcard lags for me, though. Seemed pretty cool from when I played it. I did notice some things. - The difficulty selection at times will pick the difficulty before the chosen one. For example, if you wanted to play on Lunatic and moved from Normal>Hard>Lunatic, it'll pick Hard. It overlaps the textbox when doing so. - When choosing characters, if you keep moving, there'll be a blank character option. When chosen, it defaults to the character before it. - Somehow, I must've unlocked an Overdrive difficulty where the entire screen filled with nothing but death for half the stage. I'm still trying to reproduce that madness, and record it. Once I feel happy enough with the stage, I'll post the video. Edit: Blank character seems to do the same thing as picking the wrong difficulty. Aw man, it's such a shame this demo only has 1 stage. The game's so well made and the danmaku is incredibly fun, so I've been itching for more! The music's also excellent and whoever the composer is, they got a good grasp of touhou style music. I wonder though what the C button barrier is for. I tried a good bit but couldn't figure it out. I wonder though what the C button barrier is for. I tried a good bit but couldn't figure it out. From what I've gathered, it doubles the fragments dropped from enemies destroyed within the field. The timer goes up when shooting down fairies. I'm not 100% on this, but it might increase the point items that drop or the value of them. Edit: It's on the you of tubes. Still disappointed I couldn't find out that max rank nonsense that happened earlier. It's October 3rd in Japan. They already have ver 0.01b. 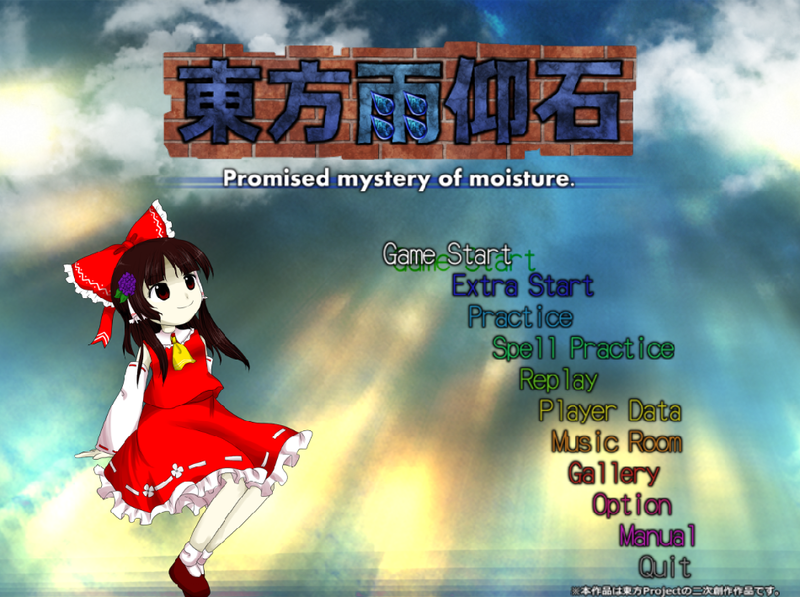 Fixes the msvcp120.dll need, but also a defect where pressing the Snapshot key gave you 50 screenshots, and better performance on Reimu's focused bomb. I'll get it tomorrow after sleeping, unless they release yet another update. Hmm... seems that the game information is tucked away inside the executable. At the very least, it seems that the game runs on other locales; that's great! Try looking at one of the strings, and look for both its UTF-8, Shift-JIS, and UTF-16 encoded forms. The 3-stage preview video has been posted! I'm not a huge fan of the stage 2 boss, but things really start getting interesting at stage 3. I wonder if the full game will have more bosses with silly gimmicks like that. Oh my gosh, what WAS that stage 3 fight! That was so quirky it was super fun to watch. Makes me wonder how it'd be on lunatic. This game's looking better and better! - The barrier-field-double-resource-thingy also must double 1ups (stage 2 midboss) and bombs. (stage 3 midboss) It seems a wee bit strong, considering the field persists even after clearing a stage. Unless the midbosses and bosses move around a lot, there doesn't seem to be a reason to not just put it in the middle of the screen. - So for the stage 3...tug-of-war, (I guess? Like Megaman 9's first Wily stage boss) how would that work for Marisa, whose shots are all aimed? Would the focus shot just pick a lane to bombard? - Stage 3 has catchy tunes. First boss nonspell - that with the rainbow - has way too much bullets, needlessly giving practically free graze. 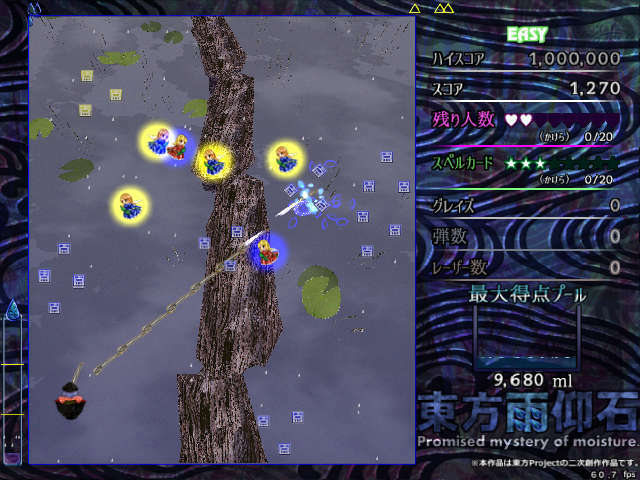 The upper rainbow could as well be replaced with a static image and the number of bullets aimed at the player should be cut in half at least. Kogasa's nonspell requires player to move around the boss, something that goes against the unwritten rule of official games that the nonspells shouldn't rely on macrododging. It's a good pattern, but it should've been a spell. Boss' first spell is way too slow (the fps counter seem to be static and thus don't indicate whether there is a programmed slowdown, and if, there is no indication how great it should be), and thus too easy. If the number of bullets fired in rings would be reduced, then the whole spell could be radically speed up. Boss' second spell seem to be a bit light on bullets. Not much (it's normal difficulty), but it's noticeable. The third spell fell a bit too short. Raise the lifebar? Wakasagihime's second bossspell has heart made out of bullets, which feels superfluous given that it just disappears after a while without being a danger for the player. Couldn't they give a static image for heart then? The rest of the midboss/boss patterns are okay, but nothing jaw-dropping. Nevertheless, i'll want to play this game. I hope the latter stages won't have such confusing gimmicks. I'm having a lot of lag too, I'm jealous of all the people who can run it at full speed without drops. I hope the next demo fixes this, or at least the full version. Speaking of which, when is the next demo? Right now. It only adds a music room though, no new stages or stability improvements. Actually, there are other improvements and additions besides the music room. From what I could pick up with the changelog on the download page, a simple manual was also implemented, various bugs such as bullets spawning right as a boss pattern ends were fixed, sound effects are handled better, and the game should be more stable and lighter to run overall. and the game should be more stable and lighter to run overall. I don't notice any difference at all. There really should be an option to tone down the graphical effects like in MPP and RSS. What's with this lack of news and demos? After six long months, we finally got an update. Two new screenshots! Amazing!